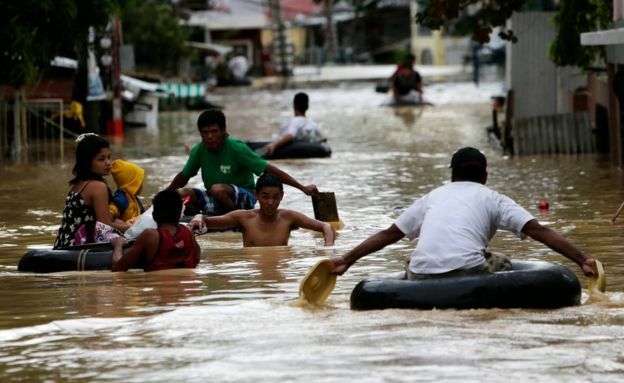 Rising floodwaters are causing alarm in dozens of villages, as Typhoon Koppu continues to drench the northern Philippines. The slow-moving typhoon has killed at least two people and forced more than 16,000 from their homes. Troops have been deployed to help residents trapped on rooftops, but are struggling to access more remote areas. Despite weakening, the typhoon is expected to stay over the country – and keep dumping rain – until Wednesday. Typhoon Koppu made landfall near the town of Casiguran on the island of Luzon on Sunday morning, bringing winds of close to 200km/h (124mph) and cutting power to vast areas. A teenager was killed by a fallen tree in Manila which also injured four others. A concrete wall collapsed in Subic town, northwest of Manila, killed a 62-year-old woman, officials reported. By dawn on Monday wind speeds were down to 150 km/h (93 mph) in the northern town of Santiago, the state weather service said. But rising floodwaters are preventing even military vehicles reaching many of the worst-hit villages and rescuers report a shortage of boats. While the Philippines is no stranger to typhoons, the slow-moving nature of Koppu, called Lando by local weather authorities, means heavy rain will fall for longer than usual, bringing greater risk of flooding and landslides. After leaving the north of the main island of Luzon on Wednesday, the typhoon is forecast to head towards Taiwan.